Enjoy artisanal and locally-grown foods at one of North America’s largest open-air markets. Jean-Talon Market is the place to see a different side of Montréal than the glamorous, French metropolis. At this farmers market located in Little Italy, you will see a rural and diverse Montréal where local farmers and artisans thrive. Arrive hungry, and enjoy. The main attraction of Jean-Talon Market is the sight of its fresh produce. Most of the market’s approximately 300 vendors sell fruits and vegetables, often in colors that you have probably never seen before. Tour the aisles to find baskets of yellow, green and purple cauliflower alongside the usual white. Enjoy the strings of shiny red and green jalapeños hanging over many stands. Also, look for purple and white bell peppers that complement the usual varieties. Visit the market between June and October to catch it at its most lively. During the warm months, the market expands outside to become the largest open-air market in North America. This is also when the produce is at its freshest. The market remains open year-round, but in the winter months it is walled up from the cold, and vendors have to source their produce from elsewhere. Look for Canadian specialties among the stands. Buy a pitcher of maple syrup and some ice wine, both bottled in the area by Québécois farmers. Try a maple-glazed salmon caught from the St. Lawrence River. Foods from across the world are common fare at Jean-Talon Market as well. Drink an espresso at an Italian café, or eat dinner at one of the nearby restaurants in Little Italy. Eat a Moroccan pastry or a Mexican taco at one of the stands in the snack bar. The market is easily accessible by bus or train, with stops only a 5-minute walk away. Parking is available as well. You should arrive early in the morning to claim a spot. Jean-Talon Market is open daily. Bring cash, since most vendors do not accept credit cards. This collection of hills in the center of Montréal is where Montrealers come to enjoy the outdoors. Hike, ice-skate and enjoy the views of the cityscape. Explore Canada’s unique cultural heritage and engage with international modern art at this large museum that houses more than 40,000 objects. Watch the monarch butterflies begin their cross-continental journey and see stick bugs from the Amazon region at North America’s largest insect museum. Once the hub for Montreal’s booming shipping industry, this historic and recreational area now draws millions of visitors to the banks of the St. Lawrence River. Sitting high above the city, this modern basilica and “house of miracles” offers tranquility, soaring Italian Renaissance architecture and Montreal’s best views. Montreal’s favorite amusement park lights up the night sky in summertime, and has some of the highest and fastest roller coasters in Canada. Highlights of this museum’s vast collection include the oldest surviving Canadian-built steam locomotive and King George VI’s locomotive. Montreal's “house of life” is a zoo, an aquarium and a nature preserve all under one futuristic glass roof. From 1847 to 1963, this Montreal landmark served as the central farmers’ market. Today, it’s an upscale mall featuring the best of Quebec’s creativity and style. Originally created as “a corsage for the city’s lapel,” Montreal’s premier gardens have blossomed into a horticultural and cultural giant. The incandescent blue and gold interior of Montreal’s spiritual heart dazzles visitors and pilgrims. It was once the largest house of worship in North America. Home to the 1967 World’s Fair, these islands offer a casino, museum, racetrack and other diverse attractions. Attend a festival in the park during the warm months. Bike or walk along the St. Lawrence, take a boat out on Lake Saint-Louis, and ride the Lachine Rapids in this water-surrounded area to the southwest of Montréal. Historic architecture, modern attractions and an exciting calendar of festivals make it impossible to get bored at this lively and scenic riverfront space. See a light show in each of the two domes of this planetarium to learn about the stars and see some impressive visuals. 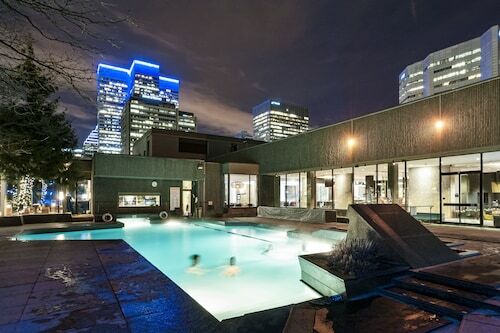 Situated in Montreal, this condo building is 0.3 mi (0.5 km) from Uniprix Stadium and within 3 mi (5 km) of University of Montreal and Mount Royal Park. Jean-Talon Market and Jarry Park are also within 15 minutes. 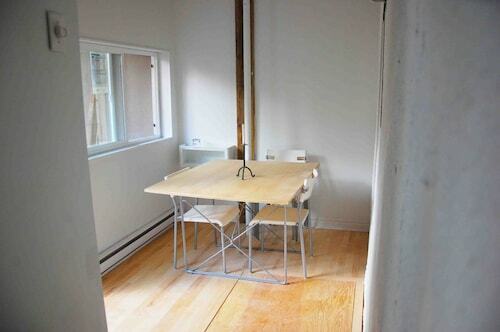 De Castelnau Station is only a 3-minute walk and Jean Talon Station is 10 minutes. Situated in Montreal, this historic condo building is 0.3 mi (0.5 km) from Uniprix Stadium and 2.7 mi (4.4 km) from Mount Royal Park. Jarry Park and Jean-Talon Market are also within 10 minutes. De Castelnau Station is only a 3-minute walk and Jean Talon Station is 12 minutes. 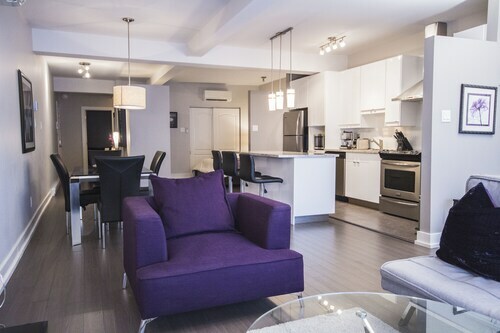 Located in Little Italy, this vacation home is 0.3 mi (0.6 km) from Uniprix Stadium and within 3 mi (5 km) of University of Montreal and Mount Royal Park. Jean-Talon Market and Jarry Park are also within 15 minutes. De Castelnau Station is 7 minutes by foot and Montreal Park Station is 9 minutes. outdoor heated pool was great even in cold, rainy weather. Great location! concierge helped get us reservations at jazz club. Situated in Montreal, this property is 0.1 mi (0.1 km) from Plaza St-Hubert and within 3 mi (5 km) of University of Montreal and Mount Royal Park. St. Denis Theatre and Place des Arts are also within 3 mi (5 km). Beaubien Station is only a 2-minute walk and Rosemont Station is 9 minutes. Located in Parc Extension, this romantic apartment building is 0.4 mi (0.7 km) from Uniprix Stadium and within 3 mi (5 km) of University of Montreal and Mount Royal Park. Jean-Talon Market and Jarry Park are also within 1 mi (2 km). Montreal Park Station is only a 3-minute walk and De Castelnau Station is 10 minutes. Excellent location. Extremely comfortable. Great communication with host. Definitely would return.